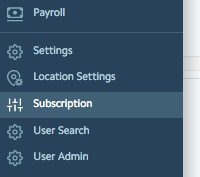 If you are an administrator with any questions about your Rotageek subscription or billing, you can start by trying to go to 'Subscription' on the left hand side of the screen. Here you will see your subscription package and have various options to customise it. Not all managers or administrators will have access to this. If you cannot see the 'Subscription' icon, or if you have any other questions, please email sales@rotageek.com and we will be happy to help!